Back to Susannah Greenberg Public Relations. INTERVIEW: Dan Griffin, M.A. author of A Man's Way Through the Twelve Steps, published by Hazelden, October 2009. Facebook: http://www.facebook.com/TwelveStepsForMen Includes book trailer video of author. AVAILABILITY: Available for interview nationwide by telephone. St. Paul, Minneapolis and environs. Travel by arrangement. A fresh interpretation of the healing process established by the Twelve Steps, with an eye toward the social, cultural, and psychological factors that affect men and their recovery from addiction. "A wonderful guide for men that reveals how to transform pain, confusion and mixed messages into a deeper and richer sobriety through the Twelve Steps." "With candor and compassion, Dan Griffin expands the power and significance of the Twelve Steps by providing a deeper understanding of what they mean to men in recovery." "This book is a beacon to guide men...based on the experiences of men who have been through the journey. Read this book if you are a man who wants to experience the promise and possibility of healthy recovery." "Truly, this book gives voice to men’s experience in sobriety. Dan Griffin addresses with compassion and understanding the difficult challenges men face when entering a world of recovery, responsibility, and relationship. It is a courageous effort to deal with many of the emotional dilemmas that face men learning to stay sober. Written to compliment and supplement the Twelve Steps, this book is for the man looking to not just be sober, but who is committed to having healthy relationships and a very full and happy life." "In A Man’s Way through the Twelve Steps, author Dan Griffin leaves no stone unturned. He beautifully reconciles the fact that men are deeply programmed to be strong, silent, self-reliant, in control, leaders, providers and having all the answers but yet the Twelve Steps require men to surrender, ask for help, die to self, depend on a higher power, clean house and serve others. Because the Twelve Steps are so counterintuitive to how men see themselves in the world, Dan, and the men he interviews throughout the book, literally offer a practical road map for men who want to experience deep change. If you have gone through the Twelve Steps, go through them again this year with a sponsor; but this time, add this book as a guide in your process. It will unlock your soul." Using interviews with men in various stages of recovery and his own experience, author Dan Griffin offers the first holistic approach to sobriety for men. Readers work through each of the Twelve Steps, learning to recognize negative masculine scripts that have shaped who they are and how they approach recovery. A Man’s Way through the Twelve Steps offers practical advice and inspiration for men to define their own sense of masculinity and thus heighten their potential for a lifetime of sobriety. Dan Griffin, M.A., has worked in the mental health and addictions field for over fourteen years. His graduate work was centered on the social construction of masculinity in the culture of Alcoholics Anonymous. Griffin lives in Minnesota and has been in recovery for fifteen years. A Man’s Way Through the Twelve Steps is his first book. "Dan Griffin is courageous in his sharing, inspiring in his healing, and tough in his insistence on men 'doing the work' of recovery. He and the men he interviewed have shared themselves without fear so that other men may find their way. And there are no greater gifts these men could give to the women in their lives - or themselves." "Dan Griffin and the men in this book have taken a brave step in openly sharing their life and experiences in order to create a more open dialogue about masculinity and recovery. This book is a must read for any man in recovery who desires to maintain quality sobriety. " 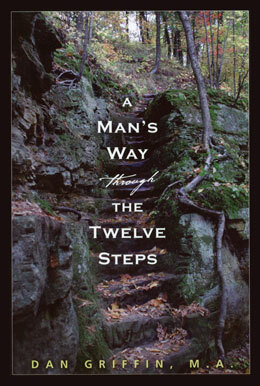 A Man's Way Through the Twelve Steps by Dan Griffin, M.A..
1. Why did you write this book? I have been in recovery for over fifteen years and I have watched men struggle with some very powerful demons in their sobriety. What I see many men running up against whether it is while they are in the throes of their addiction, early in recovery, or after having been sober for many years are the scripts they follow about being men. Those are some of the most powerful scripts we have to follow as human beings - the ones that tell us how we are supposed to act as men and women. I have sat in rooms all around the country and listened to men of all ages and from all walks of life share openly and vulnerably about who they are. And, who those men are and how they share themselves and live their lives as men in recovery is so different from how most of our society thinks about men. That is a story that needs to be told and I am privileged enough to be one of the men to help tell it. I got sober just before my twenty-second birthday and I did not have a clue about how to be in recovery or how to be a man. The men of the Twelve Step community gave me guidance and continue to show me the way. I wanted to share what I have learned and tell this amazing story about men in the Twelve Step culture. 2. What do you want men to get out of this book? Men are dying every day from addictions - every day - and they are destroying the lives of those around them along the way. First and foremost, I would like more men to get sober, stay sober, and have incredibly fulfilling lives. My hope is that reading this book will help accomplish that. My hope for men - as well as myself - is to experience life as fully as possible and discover the joy of being ourselves - regardless of what the "rules" say. Many of the men I interviewed for the book spoke of how much freer they feel to be themselves now that they are in recovery. Recovery has given these men - and those who love them - the greatest gift of all: themselves. 3. What do you want women to get out of this book? I want women to experience the men - husbands, lovers, brothers, fathers, friends, and co-workers - that they know their men can be. My experience is that women are very patient with us and forgive much of our immaturity and even inappropriateness because they can also see what is best about us. The work that many brave women, like Dr. Stephanie Covington who wrote A Woman's Way Through the Twelve Steps, have been doing over the years, especially in recovery, will always be limited if the men are not doing their work too. 4. Why is a book like this important? I had a voice inside of me for a very long time telling me that I was "not man enough". What I have come to learn is a lot of men have that same voice and many of them do not distinguish it as a voice but rather they live with it as a truth about who they are. And so they spend a lot of time trying to get rid of the voice by proving that they are "man enough." They do it by following the rules regardless of the costs. They live with that voice long into their recovery. I want men to know that they are not alone in their suffering and that the Twelve Steps can liberate them far more than they may have ever thought. 5. Where did you first get the idea for the book? I began studying gender toward the end of my undergraduate career pretty much as a fluke. Then, I got sober right before I graduated from college. When I first got into recovery I heard men talking about their inner lives in a way that I had never experienced before. In the Twelve Step culture men were publicly admitting to feeling scared, confused, or even hurt. They opened up about their struggles and doubts. I also saw men exhibiting what is best about traditional masculinity: honesty, integrity, accountability, and responsibility. The longer I stayed sober and immersed myself in the Twelve Step culture the more I became convinced that there was something special happening. 6. How could this book help men struggling with addiction? I want men to see themselves in this book and to read about ideas and challenges with which they are constantly struggling but keep to themselves because of how they have been trained to be men. I would like for men to let go of the secrets and experience freedom from their addictions. I want to give words to what so many have difficulty giving words to - so that more men may find the incredible gift of recovery, not just sobriety. 7. How can this book help men already in recovery? Men in recovery are the perfect group to read this book because they are predisposed toward talking about their inner lives. But, the Twelve Step culture has been surprisingly quiet about men's anger, abusiveness, sexism, homophobia, general immaturity, sexual confusion, unaddressed grief, and general relationship struggles. I want to raise the bar, end the secrets, and put everything on the table that is limiting the recovery of so many men. The Twelve Steps are incredible tools to help men grow up - if they use them and are challenged by other men to do so as well.